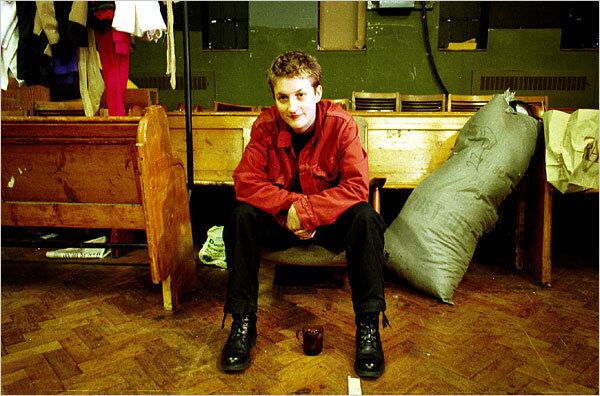 Sarah Kane has become to the theatre world what Ian Curtis of Joy Division has long been to the alternative music world: a beloved cult icon. Their darkly inspired works remain as dark and inspiring today as they did when they were first created. Both Kane and Curtis suffered from depression, and their last works (hers, 4.48 Psychosis; his, the album “Closer”) rather transparently document their unhappiness and presage their seemingly inevitable shared fate–suicide by hanging. Unfortunately, the dramatic deaths of Kane and Curtis will forever threaten to overshadow their lifes’ works. And this is precisely why, for example, David Greig works so arduously in his introduction to the Methuen edition (2001) of Kane’s complete plays to place her work in both its contemporary and historical context. He acknowledges the connections between Kane’s plays and those of the playwrights she admired, such as Buchner, Beckett, Bond, and Barker, and he also forges an association between some themes in her work and those in Shakespeare—a claim that no doubt pleases Kane’s cult but infuriates the contemptuous camp. For instance, Blasted, like King Lear, depicts human depravity and the boundlessness of political revenge; certainly, the soldier’s sucking out and chewing up of Ian’s eyes in Kane’s play does recall Cornwall’s gouging out of Gloucester’s eyes in Shakespeare’s tragedy. **For those of you living or traveling to the Miami area in the new year, Gable Stage at the Biltmore will be producing the southeastern premiere of Blasted from February 20-March 21. Until then, to find out more about her, check out this site maintained by Iain Fisher; it’s a great resource, international in its coverage, with regular updates on upcoming productions and a healthy discussion board. According to Fisher’s site, Kane’s fifth and final play, 4:48 Psychosis, which received its first production posthumously in 2000, will be running at The Sandra Feinstein-Gamm Theatre (The Gamm) in Pawtucket, Rhode Island from 14 Jan- 7 Feb 2010. And, indeed, this is true…the Gamm production will be directed by Tony Estrella. I don’t want to oversimplify the complexities of her life and death, but I think Sarah Kane was nothing more than a disturbed woman who’s misery became a benefactor to her work’s notoriety, and who’s suicide shaped her into an icon. I would probably side with those critics who called “Blased” a disgusting piece of filth. I respect the apparent historical context of her plays, especially the one I skimmed over called “Phaedra’s Love” which was inspired by Seneca’s classic text “Phaedra,” but God, why is her dipiction of brutality so casual? I like violence that is well placed and perfomed for the sake of a loved one, to survive, or escape death. Kane’s imagination is too surreal for me, she reached to be understood, to be “identified with” through writing, but I don’t believe she ever found refuge in it. Before taking a position on Kane (or any artist for that matter), it’s important to read (all of) her work. While it may be tempting to read and dismiss her plays as merely the meanderings of a disturbed mind, it is, I strongly believe, a mistake, not only because purely biographical criticism fell out of fashion many moons ago but also because Kane was innovative and talented. While her work did ‘shake up’ contemporary theatre in the 1990’s, her goal was not superficial shock value, though her characters no doubt say and do shocking things. At least one of her objectives was to make viewers think about what they see on stage , instead of passively watch. Kane’s plays force us to think thoughts and feel emotions that we’d prefer not to. They do so in an over the top way, yes, but sad fact of the matter is that they are not so over the top as to be unconceivable, in fact, the opposite. Oh my! Your mouthful about Sarah Kane is reminiscent of commentary on Jackson Pollock, which would explain why Kane disinterests me so. I have, admittedly, taken a biased position on Kane, and we could therefore argue about the validity of my disinterest, however, I will support myself upon your analysis of Kane and my comparison of her with Pollock. If you can imagine a giant, paint-splattered canvas, that was Jackson Pollock’s work. He shook up the 1960s art arena just as Kane did contemporary theatre. Some critics dismissed his art as nonsense, just as some critics dismiss Kane’s work as filth. The common thread running through both Pollock and Kane’s work is the explicit art itself and the implicit meanings they encompass. Like Kane, Pollock sought to provoke thought and wanted viewers to observe actively instead of passively. I remember insisting how ridiculous his paintings were and a Professor of mine told me that I was getting the point. I agree: that Kane’s work caused me to question her motives is proof that she accomplished her goal; maybe it WAS her objective to provoke thought, just as it was for Pollock. It wasn’t their job to answer the question, but to bring attention to it in hopes of affecting and ultimately changing society, right? Right, okay. With this being said, and assuming that Kane’s goal was to provoke thought concerning societal violence, my disinterest, and moreover repulse, lies in her attempt to use art as an instrument of change. That goes for Jackson Pollock and artists like Andy Warhol as well. There are many areas of study through which to inspire change and art is not one of them. Doctors, Social Workers, Economists, Politicians, Officers, Soldiers, Mathematicians, Historians and Engineers have verifiably done more to change society than any artist, playwright, or novelist has or ever will. I hate to see an artist struggle to accomplish what can be easily accomplished through some other discipline. I believe the purpose of art, as it has been historically, is to document, illustrate, commemorate and entertain. If one happens to take away something deep and profound, spooky and spiritual from the art, so be it, but that, I think, should not overpower the art as to abstract and spoil it; there should be balance. If Kane’s goal was to question societal violence, then she slapped the hell out of viewers with her message. Art is to be enjoyed. I don’t think I could ever enjoy Kane’s work. I’m not sure how I feel about the Pollock/Kane comparison, but I hear your personal reasons for disliking each of them. I don’t know enough about Pollock to comment on his motives. I’ve never been a particular fan of his work either. If he was trying to effect social change with his work, then it eludes me. My sense is more that he was defying convention for the sake of defying convention; Kane was not doing this. But again, I’m not a fine art scholar, so I can’t say much more about Pollock. You are right that the debate over the purpose of ‘the arts’ is centuries old, but subversive art, or art created with the hope/intent to effect change, is not. The Roman philosopher, Horace (65BC), argued that art, particularly ‘poetry’, was meant to ‘delight and instruct,’ and this p.o.v. endured for centuries and centuries, though it did not go unchallenged. During the Restoration in England, for example, playwrights attempting to establish the characteristics of native English drama, debated the merits of Horace’s claim as well as other classical criteria for plays, such as the unities of time and place. Even Shakespeare and his contemporaries used their art to critique society and, arguably, effect change, even if they did so through less blatantly subversive or iconoclastic means as Kane, by relying instead on the subtlety of puns, irony, satire, etc. So when you draw or paint, your objective “is to document, illustrate, commemorate and entertain”? If so, then you subscribe to a very classical or Horatian view of ‘art.’ Knowing you, this surprises me a little bit. You never paint anything with the objective of being more pointed, satiric, or critical? And last, I would add that while the arts typically suffer (namely from funding cuts) during periods of economic/military/political crisis, the public often turns to art for comfort/commentary, etc. I’m guessing there are a lot of people in this country right now who would be more inclined to trust the messages they take away from current art, then from economists or politicians who continue to struggle to effect real/positive/lasting/unselfish change.